1. FIRST_VALUE() : Returns first value based on partition and order by clause. 2. LAST_VALUE() : Returns last value based on partition and order by clause. 3. 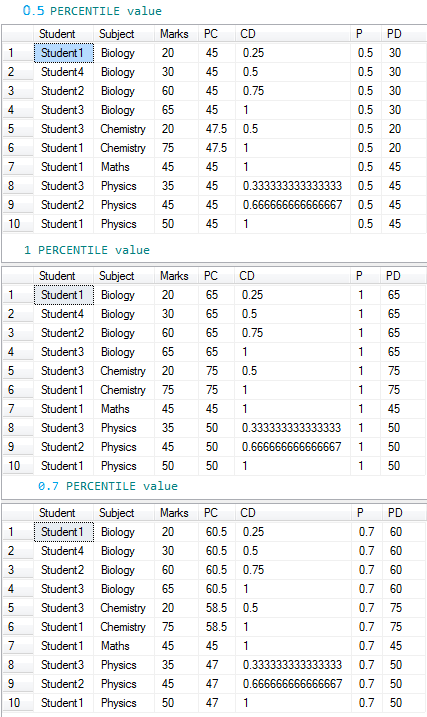 PERCENT_RANK() : It represents the percentage of values less than current value in the group excluding highest value. 4. CUME_DIST() : It gives the percentage of values less than or equal to current value in the group. This is called as cumulative distribution. 5. PERCENTILE_CONT() : Computed by linear interpolation between values after ordering them. 6. PERCENTILE_DISC(x) : Examines the cumulative distribution values (CUME_DIST()) in each group until it finds one that is greater than or equal to x. 7. 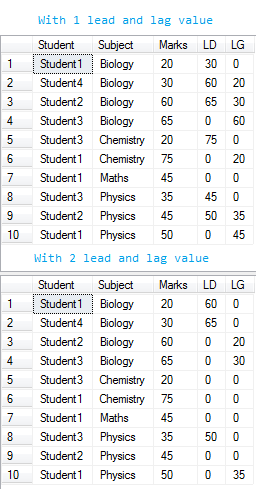 LEAD() : Used to access data from a subsequent row in the same result set without the use of a self-join. 8. LAG() : Used to access data from a previous row in the same result set without the use of a self-join. Lets brief them with proper examples and will check the resultsets return with them. To evaluate it, we need sample table, so let create and populate it first. First, we will run workaround for the first two functions, FIRST_VALUE() & LAST_VALUE(). 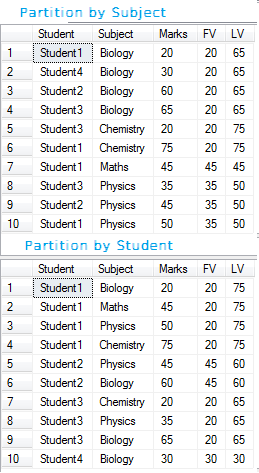 You can see as per partition these functions returned first values and last values. Now the second chance to evaluate PERCENT_RANK () and CUME_DIST () functions. and for 1rd value, PERCENT_RANK() will be (1 - 1)/(4-1) = 0/3 = 0 .
and in a group 4 values, for 1rd value, CUME_DIST() will gives 1/4 = 0.25 . Above explanation I have given for the 4 values of groups, You can calculate for 3 values of groups as per that. For PERCENTILE_CONT(), it will be calculated as per following formula,Please note input parameter of percentile function must inside of range [0, 1]. 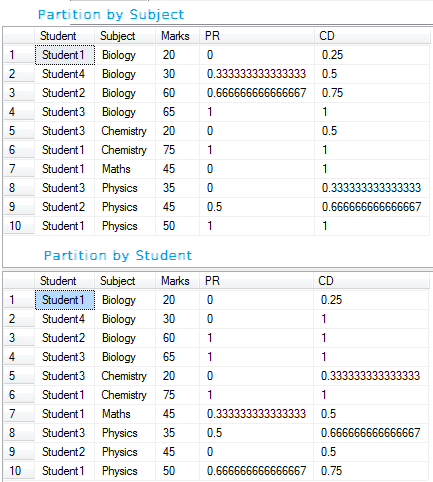 You can calculate for all the groups and different percentile values as per above formula. PERCENTILE_DISC(x), like in example for four values of group with percentile value 0.5 , As per sort order it found first 30 as its cumulative distribution value(0.5) which is equal or grater than percentile value(0.5). A returned value based on specified offset where offset is the number of rows forward/back from current rows to get value. The default value is 1. Enjoy CTP3!